I am still mulling over the Bureau of Economic Analysis’ recent, erroneous, GDP projection after my last post Gross Domestic Product (GDP) Mumbo Jumbo. One aspect that was not addressed previously was the pace at which our National Debt is catching up to annual GDP. The question for today is what will Gross Domestic Product need to be in 2019 in order to keep pace with the Federal Government’s ruinous spending? And based on the answer to that, at what pace must the economy grow annually? Thus, the first scenario, below, determines the rate of growth necessary in order for GDP to match our projected debt. The second scenario determines the rate of growth needed in order to return to the 2003 debt-to-GDP ratio of 62.8%. Finally scenario three simply states the obvious. GDP must grow from $14,198.5 to $19,224.3 billion in order to equal the National Debt by 2019. In other words, GDP must increase by $5,025.8 over the ten year period. This represents an increase of 35.4% for the period. That means that GDP must grow at a rate of 3.54% per year in order to equal our National Debt by 2019. As I clarified in my last post, GDP is currently declining at the rate of 1.21% per year, so although this is achievable, we still have a ways to go on this road to nowhere. In order to return to the more prosperous, albeit not the most optimal, 2003 Debt-to-GDP ratio of 62.8%, annual GDP must grow to $30,611.9 by 2019. 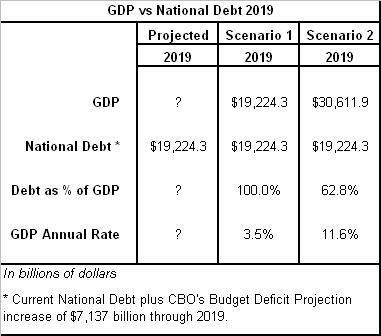 In other words, GDP must increase by $16,413.4 billion, over 10 years, in order for the National Debt to equal 62.8% of GDP. That equals a percentage increase of 116.0% over the 10 year period. In other words GDP must grow at the rate of 11.6% per year, over the next 10 years in order to return to the 2003 Debt-to-GDP ratio. Scenario #3 – Stop Spending Money that we don’t have. Of course there are many possible scenarios. One common sense scenario would be to stop spending money that we don’t have. I don’t think it’s possible to grow the economy at 11.6% per year. At least I don’t see any plans from the Congress, the Senate, or Obama that would come anywhere close. In fact, their current plans do nothing to increase GDP, but rather are focused shamefully on doubling the National Debt. And you know what that means: higher taxes, and higher interest rates, leading to less economic growth. GDP must grow at an annual rate of 3.54% in order to equal the National Debt by 2019, a road to nowhere. GDP must grow at an annual rate of 11.6% in order to return to the 2003 Debt-to-GDP ratio of 62.8% by 2019. Government spending needs to be cut dramatically, and immediately. Any plan that falls short of scenarios #2 and #3 is not a plan. That’s the raw truth. I appreciated someone doing the math. It is strong evidence that the ruinous path now underway is intentional, precisely the sort of thing people caught up in a religious furvor are least likely to believe. Excellent analysis and frankly this is pretty scary stuff. Given we've lost 8.5 million jobs since this great recession has begun, the likelihood of us returning to a sustained growth of minimum 3.54% as suggested is pretty slim. Hope you don't mind, but I put a brief excerpt on my blog with some commentary myself, and linked to your original article. Hope it drives some traffic your way, this type of analysis really needs to get visibility. Thanks NoBamaNation, I don't mind at all. And thanks to Joel Raupe. The only way people are going to believe is to see it in black and white.